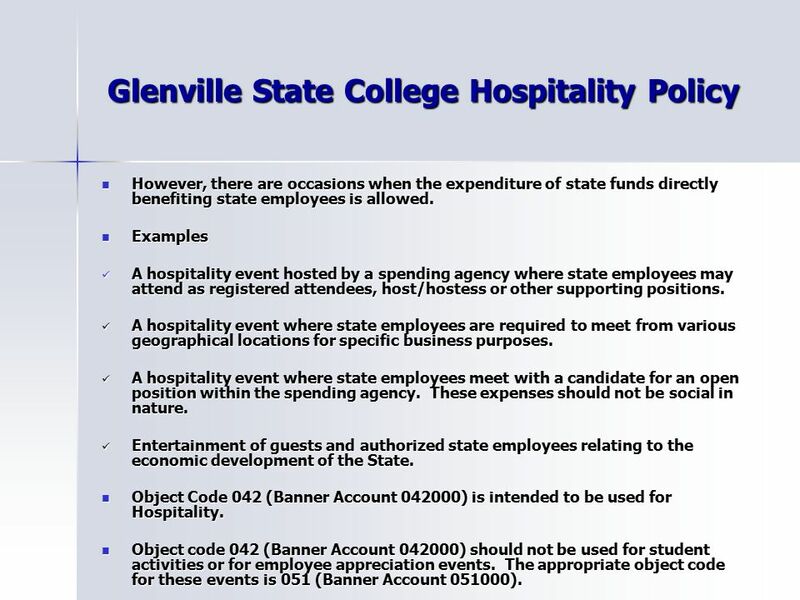 Glenville State College Hospitality Policy Hospitality is defined as the expense of state funds for the reception of GUESTS by a spending agency for a. 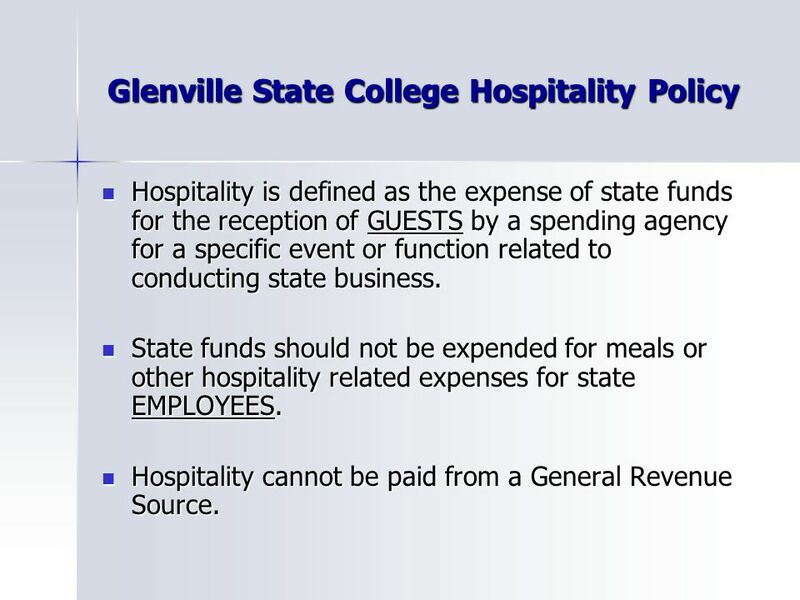 1 Glenville State College Hospitality Policy Hospitality is defined as the expense of state funds for the reception of GUESTS by a spending agency for a specific event or function related to conducting state business. Hospitality is defined as the expense of state funds for the reception of GUESTS by a spending agency for a specific event or function related to conducting state business. State funds should not be expended for meals or other hospitality related expenses for state EMPLOYEES. State funds should not be expended for meals or other hospitality related expenses for state EMPLOYEES. Hospitality cannot be paid from a General Revenue Source. Hospitality cannot be paid from a General Revenue Source. 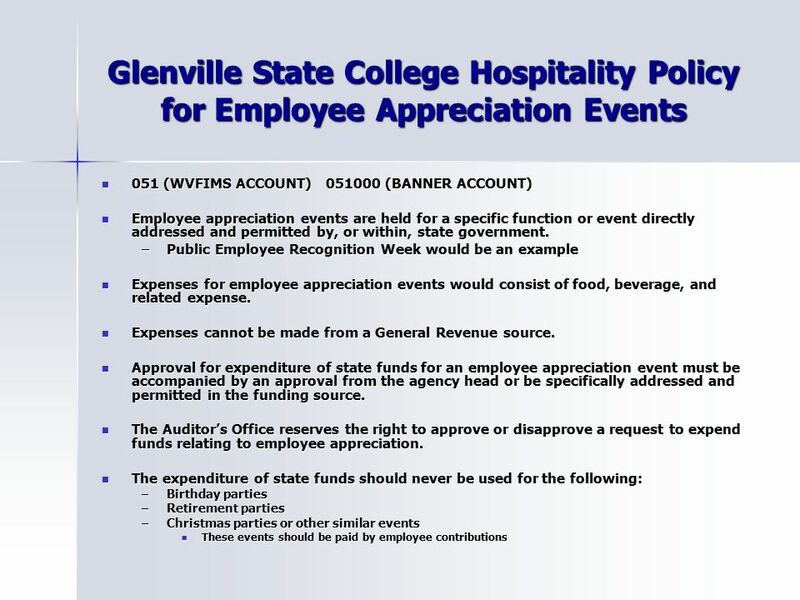 2 Glenville State College Hospitality Policy However, there are occasions when the expenditure of state funds directly benefiting state employees is allowed. However, there are occasions when the expenditure of state funds directly benefiting state employees is allowed. Examples Examples A hospitality event hosted by a spending agency where state employees may attend as registered attendees, host/hostess or other supporting positions. A hospitality event hosted by a spending agency where state employees may attend as registered attendees, host/hostess or other supporting positions. A hospitality event where state employees are required to meet from various geographical locations for specific business purposes. A hospitality event where state employees are required to meet from various geographical locations for specific business purposes. A hospitality event where state employees meet with a candidate for an open position within the spending agency. These expenses should not be social in nature. A hospitality event where state employees meet with a candidate for an open position within the spending agency. These expenses should not be social in nature. Entertainment of guests and authorized state employees relating to the economic development of the State. Entertainment of guests and authorized state employees relating to the economic development of the State. Object Code 042 (Banner Account 042000) is intended to be used for Hospitality. Object Code 042 (Banner Account 042000) is intended to be used for Hospitality. Object code 042 (Banner Account 042000) should not be used for student activities or for employee appreciation events. The appropriate object code for these events is 051 (Banner Account 051000). Object code 042 (Banner Account 042000) should not be used for student activities or for employee appreciation events. The appropriate object code for these events is 051 (Banner Account 051000). 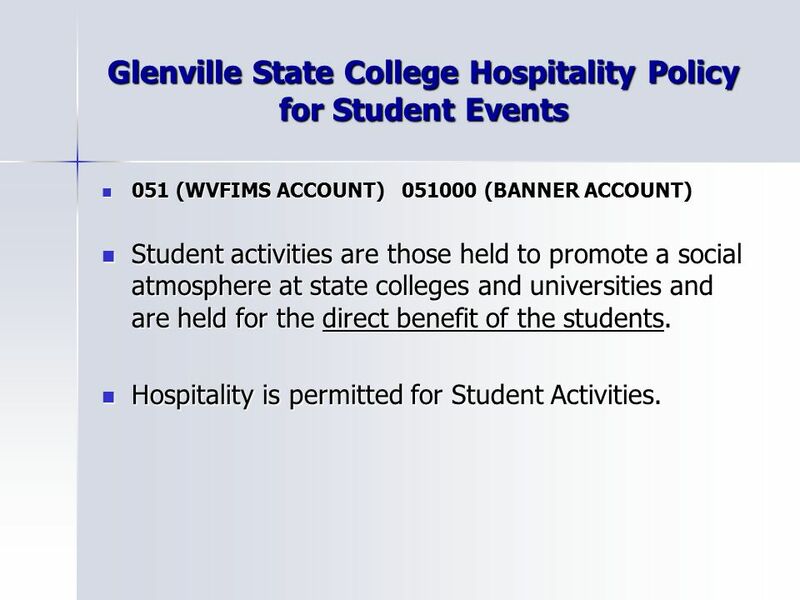 4 Glenville State College Hospitality Policy for Student Events 051 (WVFIMS ACCOUNT) 051000 (BANNER ACCOUNT) 051 (WVFIMS ACCOUNT) 051000 (BANNER ACCOUNT) Student activities are those held to promote a social atmosphere at state colleges and universities and are held for the direct benefit of the students. Student activities are those held to promote a social atmosphere at state colleges and universities and are held for the direct benefit of the students. Hospitality is permitted for Student Activities. Hospitality is permitted for Student Activities. 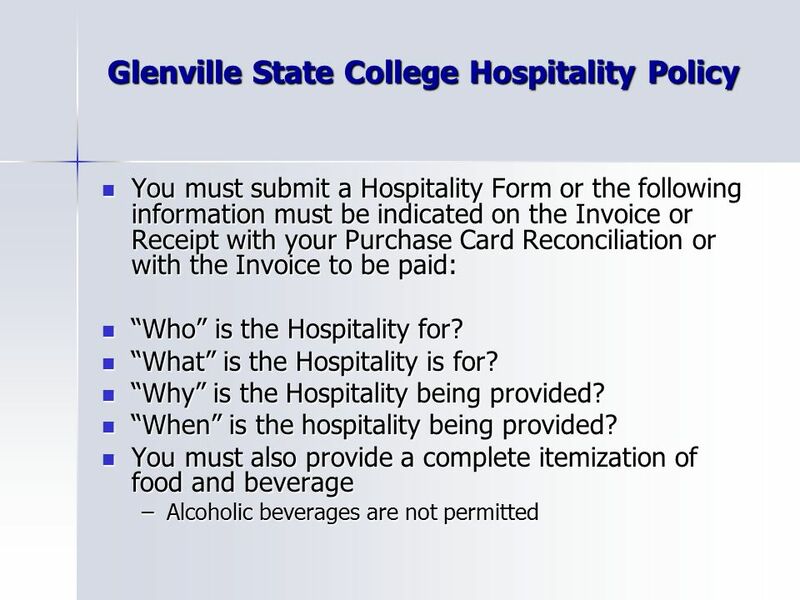 Download ppt "Glenville State College Hospitality Policy Hospitality is defined as the expense of state funds for the reception of GUESTS by a spending agency for a." Implementation of the new State-wide Financial System (SFS) required all agencies to implement changes to the Travel Card Program. o OGS is requiring. Procurement Card Policies and Guidelines Arkansas Tech University. Business-Related Hospitality and Entertainment Expenditures Guideline Changes Business-Related Hospitality and Entertainment Expenditures Guideline Changes. Payments to Individuals  Independent Contractor/Consulting Agreements Purchasing Presented by: Michelle Hodge. Scroll to the appropriate slide that best describes your situation and follow the flowchart to determine which form to use. CAL POLY POMONA 1 DIRECT PAY WORKSHOP MARCH 11, 2015. Financial Services By: Deidra & Christina. I want to buy something…can I just go to Wal-Mart? Decide exactly what you need. ◦ Is it available through. State Film Tax Credit Incentives John C. Genz CPA, MST Partner-in-Charge, State & Local Tax Group. PCard Plus Enhancement Revised 2012 Supplemental Information For Complete information Refer to Procurement and Contracting Services PCard Policy and Financial. Procurement Training.  Limited Purchase Checks (LPCs) may be used by departments for small dollar purchases up to the limit printed on the face of the. Accounting Transactions (A) Expenditure Transfers (B) Creating New Funds and Organization (C) Changing Financial Manager.